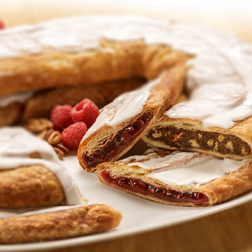 Now you can have your cheesecake and Kringle too! 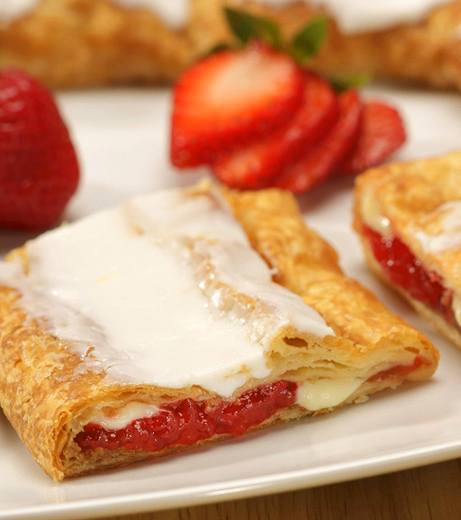 Sweet strawberries, smooth cream cheese filling, all topped with our sweet vanilla icing. 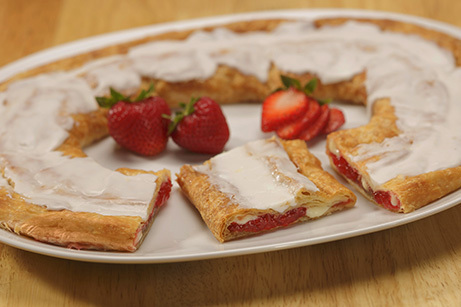 It's summer in a Kringle! Wheat Flour, Margarine (Interesterified Soybean Oil, Water, Salt, Mono- and Diglycerides, Colored with Annatto/Turmeric. Calcium Disodium EDTA preservative. Artificial Butter Flavor. Vitamin A Palmitate added. ), Sugar, High Fructose Corn Syrup, Brown Sugar (Sugar, Molasses, Cane Syrup), Strawberries, Eggs, Corn Syrup, Contains 2% Or Less of the following: Modified Food Starch, Salt, Cream Cheese (Pasteurized Milk and Cream, Cheese Cultures, Salt, Gums (Locust Bean, Xanthan)), Maltodextrin, Soy Protein, Yeast, Dextrose, Potassium Sorbate Preservative, Agar-Agar, Guar Gum, Sodium Benzoate Preservative, Tocopherols Preservative, Calcium Carbonate, Palm Oil, Soyean Oil, Benzoic Acid, Lactic Acid, Polysorbate 60, Canola Oil, Red 40, Natural & Artificial Flavors, Calcium Propionate Preservative, Malted Barley, Corn Starch, Cinnamon, Soy Lecithin, Color Added.